Not much stands between a motorcyclist and the open road. While that often adds to the thrill of cruising down the highway, it also makes bikers particularly vulnerable to injury and even death in the event of an accident. It's important to understand the injury risk, and what to do if you're hurt in an accident caused by another person or entity's negligence. A severe type of abrasion injury, road rash is caused when a motorcyclist slides across the asphalt or concrete, stripping away various layers of skin. In severe cases of road rash, skin may be scraped all the way down to the bone and the victim may require plastic surgery to close the open wound. Motorcycle accident victims who land on their upper arms with their full weight, or have their bike topple over onto them, may suffer from a kind of nerve damage known as rider's arm. This condition often causes reduced mobility or even paralysis. Motorcycle helmets dramatically reduce the risk of head injury. Sadly, not all bikers wear them, putting them at risk for skull fractures, concussions, and traumatic brain injuries (TBI). Motorcycle crash-related head and brain injuries cause life-altering symptoms, and long-term physical, cognitive, and behavioral impairment. Trauma to the back or spinal column can lead to devastating injuries for motorcyclists. These injuries include torn ligaments, displaced vertebra, herniated discs, and spinal cord damage. Trauma to the spinal cord is one of the most severe injuries in this category, as it can result in varying degrees of paralysis that may be temporary or permanent. Riders who suffer broken or crushed bones may require extensive orthopedic reconstruction. Victims may also lose limbs or appendages in an accident, or require amputations of legs or arms which can't be saved. The face and mouth are particularly vulnerable to serious motorcycle accident injuries. Victims may suffer from eye damage or vision loss, broken facial bones, loose or missing teeth, facial scarring, and other complications. Some crash-related dental and facial injuries can be disfiguring, affecting a victim's self-esteem and confidence. Riders injured in wrecks often suffer blunt force trauma to the chest. This can result in broken ribs, collapsed lungs, internal bleeding, or organ damage. Motorcycle accident victims are also susceptible to open wounds due to road rash, a puncture from a broken bone, or a penetrating object. These wounds are often contaminated by dirt, shards of metal or glass, or other debris, and require professional debridement. Open wounds also put people at risk of developing infections. 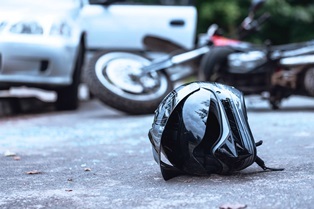 Motorcycle accidents are traumatic experiences that have long-term psychological consequences. For example, injured bikers may struggle with severe anxiety, clinical depression, or even PTSD. Psychological injuries may be particularly critical for victims facing a permanent injury, such as paralysis, a TBI, or disfigurement. Hurt in a GA Motorcycle Accident? We Can Help. If you were seriously injured in a crash caused by another person or entity's negligence, you might be entitled to compensation for damages. The knowledgeable personal injury attorneys with Van Sant Law will detail your rights, explore legal options for compensation, and banish misconceptions that could result in you collecting a smaller financial recovery than you're owed. We'll help you fight for the damages you deserve. Do you have questions about a motorcycle accident injury case? Contact us today to schedule an appointment for a complimentary initial consultation. Don't wait! The time to file a personal injury claim is limited. In Georgia, motorcycle accident victims have just two years from the date of the crash to file a lawsuit. Do You Have a Motorcycle Crash Case?